This is one of those time when watching the high frequency data is so important, because the trends do appear to be changing. December and January were revised upward by +9,000 and +22,000, for a net change of +31,000. The more leading numbers in the report tell us about where the economy is likely to be a few months from now. These were neutral to negative. the average manufacturing workweek was unchanged at 41.8 hours (but last month was revised up +0.1. This is one of the 10 components of the LEI, the net will be a posittive. construction jobs increased.by +19,000. YoY construction jobs are up +253,000. manufacturing jobs decreased by -16,000, and are up +25,000 YoY. Professional and business employment (generally higher-paying jobs) increased by +23,000 and are up 604,000 YoY. temporary jobs - a leading indicator for jobs overall decreased by -9,800.
the number of people unemployed for 5 weeks or less - a better leading indicator than initial jobless claims - increased by +48,000 from 2,249,000 to 2.297,000. The post-recession low was set 6 months ago at 2,095,000.
the index of aggregate hours worked in the economy fell by -0.4 from 105.3 to 104.9. The broad U-6 unemployment rate that includes discouraged workers declined from 9.9% to 9.7%. the index of aggregate payrolls fell by -0.7 from 127.8 to 127.1. Government jobs rose by +12,000. the overall employment to population ratio for all a ges 16 and above -rose by 0.2 from 59.6 to 59.8 m/m and +0.5% YoY. The labor force participation rate rose 0.-1% from 62.7% to 62.9% and is now up +.0.1% YoY (remember, this incl udes droves of retiring Boomers). The headline numbers - strong job gains, and a decline in the broad U6 underemployment rate - are certainly welcome. Other significant positives included positive revisions to the last two months, an increase in both the employment to population ratio and labor force participation rate, and a decline in those out of the labor force who want a job now (but still about 1.4 million above its 1999 and 2007 lows). In short, while the strong positives in coincident measures of employment are certainly welcome, the decline in some important leading indicators for employment raises a significant yellow flag. 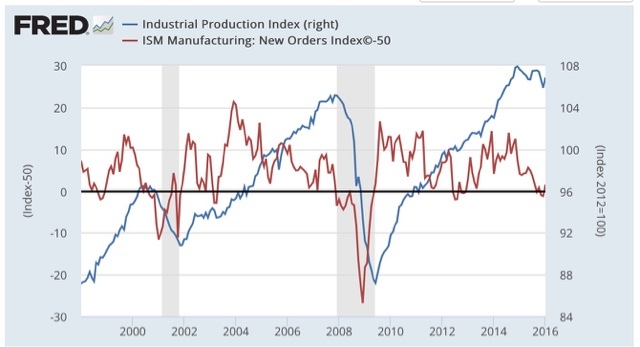 I wrote a month ago that before either an inventory slowdown or a recession end, the new orders sub-index of the ISM Manufacturing Index turns up first. The inventories component tends to trough at the end of a recession, or sometimes bounce along a bottom for a few months. It was encouraging one month ago that new orders were above 50 showing expansion. 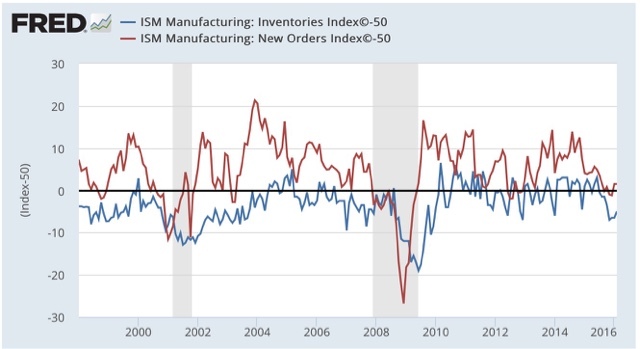 Note, by the way, that both new orders and inventories are consistent with levels we saw during past non-recession inventory corrections, in 1996, 2002, and 2012. For me to be confident that this slowdown was ending, I would want to see new orders spike to at least 54. They didn't do that. That doesn't mean that I expect things to get worse. In fact there are encouraging signs in things like steel production and rial shipments that we may have bottomed. The failure of new orders to pick up means at least that we aren't out of the woods yet. I have a new post about the two most leading sectors of the consumer economy - housing and cars - up at XE.com. Apologies for the light posting this week. I'm travelling again. No photo this time, but I just paid $1.49 a gallon for gas. I wonder if i will ever see a price that low again in my lifetime. Yesterday morning at hotel breakfast, I had an unpleasant encounter with an odler white couple badmouthing CNN for calling Trump on at least not knowing that he ought to refuse support from the KKK. The possible election of Donald Trump as President is the greatest present threat to the prosperity and security of the United States. ... [N[ever before had I feared that what I regarded as the wrong outcome would in the long sweep of history risk grave damage to the American project. Donald Trump is the type of demagogue the founders warned us about. Well put, Larry Summers. 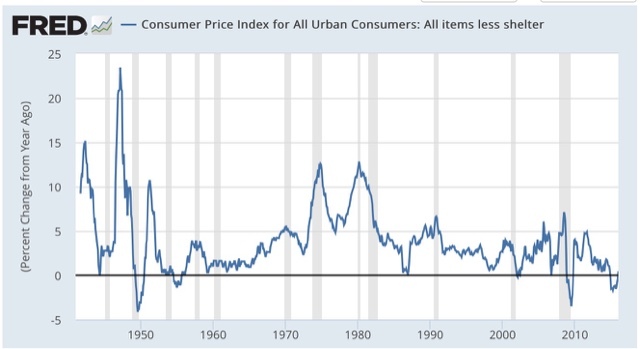 If higher inflation is being driven by rising rents, it is not clear that higher interest rates are the right tool to bring prices down. 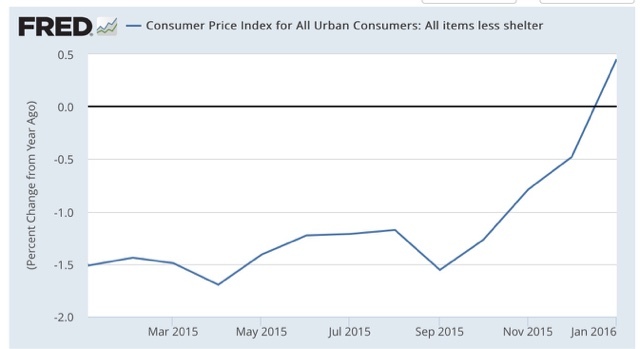 Every Econ 101 textbook tells us about supply and demand. The main factor pushing up rents is more demand for the limited supply of housing. The best way to address this situation is to construct more housing. But housing is perhaps the most interest sensitive component of demand. If we raise interest rates, then builders are likely to put up fewer new units. This will create more pressure on the housing stock and push rents up further. This is the very point I have been making for the last few months.